Are we encouraging and applying critical-thinking skills in our personal debates of public issues? We’ve been too inured to hearing and seeing probably at least 50 (Maybe a lot more! Check your number of media friends and following!) falsehoods or misleading information every day that somehow a portion of our global and local communities may not only be gotten used to it, the people have also unwittingly put walls between them and the facts. Sometimes it’s ridiculously painful to watch people defend a cause using an array of inaccurate viewpoints and hoaxed information. The sad part is that I see this growing phenomenon of societal indoctrination of lies and misleads being fully embraced even by people who I believe are somehow reasonable and good-hearted. The motivation to strongly defend at all cost a personal value outweighs the morality and the integrity of the truth. The truth becomes a million discombobulated pieces to a puzzle game. The thing is, navigating through a plethora of information isn’t actually difficult, only time-consuming and requiring of a pair of objective senses. The danger of getting sucked into the phenomenon of falsehood is that the conversation is deflected from the real issues to the ridiculous. And often, instead of having the parties from opposing stances come together to search for the truth, the communication now becomes a tribalistic debate of proving which position is right. Take the topic of vaccination for instance. A vaccine is not 100% effective and it’s not without side and adverse effects which may include anaphylactic shock. No manufacturer or pharmacist following the legal mandates on drug production and dispensary will say otherwise. A vaccine is not intended for people with allergies to any of its components. It may be argued that some of the science behind the corporate medical practices and pharmaceutical industry is driven by profit goals. However, instead of pushing an advocacy that presses the pharmaceutical industry and medical field to improve patient care and the safety, cost, efficacy, and application of the vaccines, the discourse has now on a total abandonment of vaccinations for preventative care. There’s a segment in the community that aims to discredit the factual and proven historical successes of the drugs. The group has taken a broad brush approach to vaccinations and have even made an opinion-based stand on advocating against existing policies. If you look closer, the issue against vaccines is mostly about people’s trust in science exacerbated with a very low level of scientific knowledge and lack of motivation and ability to research for unbiased information. We’d be living in a world inundated by smallpox and polio sufferers if the science community, the government, and the community-at-large hadn’t employed the use of vaccines. Let me definitively say, based on the World Health Organization reports, NIH, and individual public health records, and unending studies and researches that vaccines do work, and by and large, are guarded by safety protocols and guidelines. Time and time again, the reputable organizations, based on irrefutable evidence, have released comprehensive reports debunking any link of vaccines to autism. Also, there’s no proven evidence and factual basis to the suspicion that the cumulative exposure to vaccines lowers children’s immunity. The vaccine court’s data show that bona fide vaccine injuries are rare. The shift from the fear of disease to concerns about risks of the vaccines themselves. And then we have had debates on the ACA (Affordable Care Act) that started and continued to be contentious not so much because of its content but more so because of political disputes and likely biases. It didn’t help that this healthcare policy, although not ideal but nonetheless run on a framework of a universal right to healthcare, was nicknamed the ObamaCare when the political discourse was already polarizing. Healthcare is everyone’s business because it affects all. The premise of “why should I pay for other people’s care when I have nothing to do with them” is not only simplistic and shortsighted, the mindset also furthers the polarization in the debate. I would argue that although not everyone is convinced that healthcare is a universal right and everyone’s responsibility, there’s no argument, regardless of where we identify in the political spectrum, every one of us agrees that the economy is important to every household. If this is the case, why are we as a critically thinking public not expanding the conversations to include the causal relationships between productivity and healthcare coverage, or how discriminating against preexisting medical conditions potentially affect the labor market? Or how has the Affordable Care Act affected work and wages? The general public’s predilections to lean towards identity politics may be too much of a barrier to overcome. That instead of being motivated to journey towards what’s universally real and accurate, the individual will most likely contain his analyses towards how best to advance his identity-driven values. I’m making an intentional and critically-minded decision not to be conned into choosing between religion and science. A support to science isn’t an outright lack of belief in Divine Intervention. A life guided by faith and spirituality does not necessarily constitute an abandonment of evidential reasoning. Personal biases and environmentally-acquired prejudices, in addition to a deeply-rooted aversion towards being proven wrong, makes it unlikely for a person to apply a scientific research approach in seeking objective data through a plethora of information. As a woman of faith, I’ve witnessed how readers and preachers study the scripture without regard for the historical timeline, geography, and culture of the time and then consequently take the scripture out of context. They either use the passage as a Hallmark card tagline or to manipulate the message to fit into an agenda or the desired culture of their congregation. We’ve seen how verses in the Bible and the message of Koran twisted and corrupted to justify indefensible violent and abhorrent actions. Sometimes, if we’re not mindful, the line that separates religious beliefs from cultic predilections can become indistinguishable. We heard the current AG referred to a passage in the Bible and shamelessly invoked Apostle Paul in an effort to justify the Whitehouse’s zero-tolerance policy on immigration. The brazen approach to use God’s word in order to deflect from the inhumane positions the government has taken against immigrants, including those who are seeking asylum is shocking but not revolutionary. The Bible will tell us that the Pharisees and false prophets had done this many times. Can we bring people together and have a level-headed and wholehearted discussion of where we are headed as a nation and as a global community? Let’s for one moment make the time to deconstruct the universal and local benefits of a mandate that doesn’t support the protection of the distressed and the promotion of human rights. When did it become universally beneficial and moral to pluck children away from their families who don’t pose danger to themselves and to society? In a world where one in four people will be affected by mental or neurological disorder at some point in their lifetime, it’s mind-boggling that anyone with a heart and soul would support a mandate that promotes isolationism and a propaganda that disregards the tenet of human compassion and God-given grace. The image and the core of the zero-tolerance immigration policy are disturbing and any attempt to justify its applications isn’t just repugnant, it’s immoral. It’s scary how the disturbing flow of current events in today’s news cycle would bear a close resemblance with certain fictional TV series, in particular, The Handmaid’s Tales. It’s fascinating how many Aunt Lydias, Colonel and Mrs. Waterford have boldly came out in open and complicit defense of a disturbing set of beliefs. It’s astonishing to watch the characters uphold their values as if these were evidential and moral facts. Try to dig deeper into the different allegorical representations of the various handmaids in the series’ storyline. And then, connect the inferences with that of yours of the antagonists in the storyline and you’ll see what I’m so concerned about. And maybe, if you haven’t yet, you will at least consider concurring that the Aunt Lydia joke made on the WHCD was not a jab on Sarah Sanders’ looks. That’s another discussion. But watch the series, or not. When you do, take off your religious, judgmental hat and see the art and the message in the storytelling with objective, unhindered sight. It may be that the TV series comparison I made was daring and scandalous. 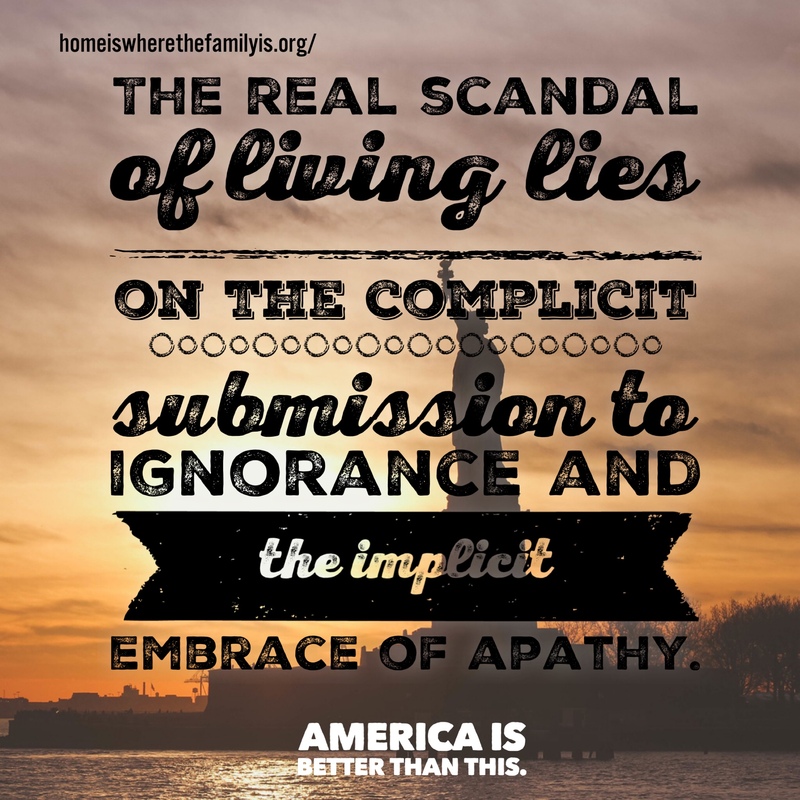 The real scandal, however, lies on the complicit submission to ignorance and the implicit embrace of apathy. Making moral equivalencies, for instance, by invoking the plight or the needs of the military in the country to justify mandates that not only promote isolationism but also shows a lack of compassion for asylum seekers and their children. When you’re okay at seeing children get plucked out from their parents (especially if this terrible act is weaponized to deter illegal border crossings), know that you are advancing the virtue of the real religion you represent. The truth is that children should not be used as a negotiating tool. To use them to forward a political agenda isn’t just abhorrent, it is immoral and inhuman. Although moral virtues are independent of each other, one cannot stand upright in the sacrifice of another. My continuing hope is that we come together as a humane society determined to work together in our universal and specific quest for the truth. May we realize that the real scandal of living in this day of high-speed, high-volume information age lies on the complicit submission to ignorance and the implicit embrace of apathy. The bottom line, whether you’re advocating for or against vaccines, defending a political agenda, fighting for economic or social injustice, or invoking religious beliefs, make it intentional to journey towards the truth even if the facts lead you out of your comfort zone.